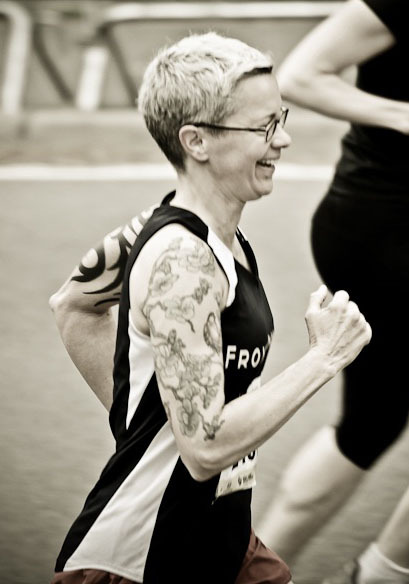 Further evidence that I was not working very hard in the 10k given the big grin on my face. What the heck was I thinking? 7557 people run the NYRR Healthy Kidney 10k today, 3643 of them were women, 212 in my age group. I came in 7th which is a bit disappointing, but I did not have the mental strength today. It was packed. I arrived much later than normal and was stuck in the back of the corral. Due to the amount of people my 7:04 pace pushed me back into the yellow, third corral. Somehow a huge number of runners who had no business in that corral got in, tons of brown bib which I do not even know what that pace is 12:00 miles? The wrongly lined up runners were in the way, they were dropping out in the first 1/2 mile, it was more annoying today than it ever has been. I had to wait for several minutes before I got to the start line, the finish would be 200 meters in front of that, after running the 6 mile loop. 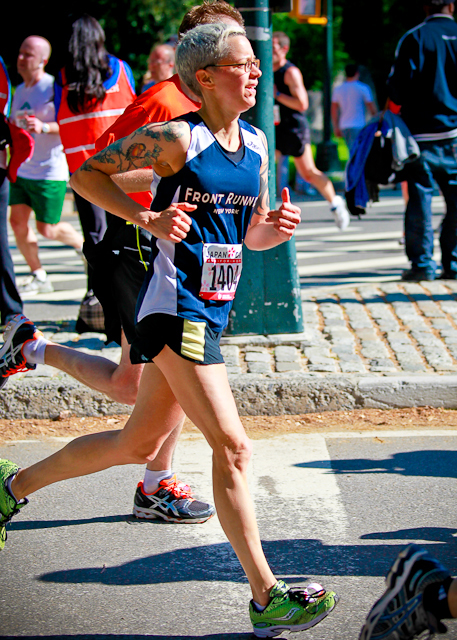 From the horn going off to the 200 meters it was 4:30, at mile 1 the clock read 9:40. I did not wear my watch but I calculated some of the miles, my mile 2, 3, an 4, were between 7:15 and 7:20 which I wanted. I ran steady but did not push it hard. I do not even know how slow that first mile was. I could have been more aggressive and push through people, I could have worked harder, I just ran through the finish, but I did not have it in me mentally. A young guy in the last 600 meters began to walk so I pulled him back onto his feet – to beat me of course. My focus is on the Brooklyn 1/2 next weekend. I need to run fast enough to qualify for the the NYC marathon and stop all this 9+1 racing nonsense. BTW I have run 11 races since 1/1/2011, it is time to rest a bit. My finish time was 47:17, 15 seconds slower than the 10k on April 10th, but a whole lot easier, and a 1:20 slower than my last Healthy Kidney. My ultimate goal for the year is to run 43:30, 7:00 minute pace for the 10k. I have some work to do and right now I am very lucky. I am going to NM for three months. I will train at 7,000 feet elevation on the dirt trails. I can’t wait. No work obligations, nothing. The best part of the day was to see all my Front Runner buddies. May 8th was a great day for running. It was beautiful in Central Park, 53 degrees, 72% humidity and 5072 runners. It is way too many runners but fortunately I was in the second corral, in the top 1404 to start, so it wasn’t terrible. I generally start out slow, to warm up and keep calm among the huge crowds. My first mile was 7:21, faster than the last couple of weeks which was nice but scary at the same time because that could means intense pain at the end. Mile 2 is always fast because of of the downhill, I ran a 6:50 followed by a lackluster 7:20 third mile. Those rolling hills always kill me. Last year I did a number of tempo runs over the rolling hills and I think it is time to do it again. My last mile I brought it back to 7:05. I finished with a 28:37, just 10 second shy of my PR, but the best part is that I felt really strong. I felt like I gave a very even effort. The confirmation of my hard work came in three very strong dry heaves right when I crossed the finish line. I was a bit worried there still might be some oatmeal in my stomach, but thankfully none of it appeared. I was very happy with the race. And ran an easy 5 later that night. An AG of 73.2% my highest yet. Stay tuned because I am headed to New Mexico for 12 weeks of high altitude and mountain running. I plan on coming back to kill the marathon and take my 4 miler to sub 7:00 pace.